dilution substances that are added to a urine specimen at the time it is collected or are ingested before an individual submits a urine Specimen. adulterants that are used to destroy or alter the chemical make-up of drugs and are added to a urine specimen at the time that it is provided for testing; and 4) synthetic or drug-free urine that is substituted in place of an individual's specimen and provided for testing. If you suspect that a urine sample may have been altered or "masked", you should consider using a urine adulteration test to check the sample. There is an array of products designed to dilute, cleanse, or substitute urine specimens submitted to testers by drug users to adulterate urine samples. For more information on products which mask the presence of illegal drugs when a urine drug test is administered, see Detox - Pass A Drug Test. The above is an example of the Specimen Validity Test (a.k.a., urine adulteration test). Simply dip the test strip and see the results. For single use only. E-Z Split Key Integrated Drug Test Cup with S.V.T. Above is a multi-panel E-Z Split Key Integrated Cup with Specimen Validity Test (urine adulteration check). The drug test and adulteration strip are both built in to the urine sample cup. Therefore once the sample is received and the lid closed, just push the key in and read the results. This test is extremely easy to use! 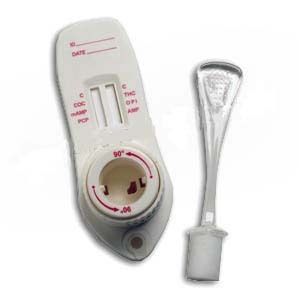 The above is an example of a typical 5 panel urine drug dip test with built-in adulteration. 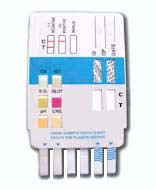 This 5 Panel Drug Test is for one time use and will detect the presence of 5 different drugs of abuse.